I have a Rizzuto Estileto Milano that is in “NEW and/or MINT” condition. I think! It was given to me in the early 1960’s, and had remained in my jewelry box until yesterday when I Googled the manufacturer. 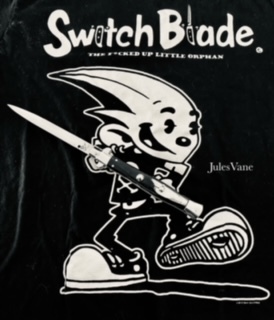 I had no idea it was a switchblade until doing some research and figured out how to open it. Thank goodness there was a YouTube video of a man opening a white one. I had no idea it had a “locking” mechanism. The blade is 3” from tip to casing, and the casing is 4” for a total length of 7”. I believe yesterday was the first time it had been opened, and when I pushed the correct button(s) the knife immediately popped open to the full position, and I heard a “ping” sound. One of the “finger guards” flew off and went behind my office desk which is impossible to move. At least I know where it is! And I assume this is one of the reasons why so many people write that it was poorly made. There is no “wobble” to the blade (I read that they all wobble) and it opens and closes properly with no knife protruding in the closed position. It has two temporary “stop” positions when closing. In other words, there is a slight stop at two predetermined angle degrees that the manufacturer set. The locking mechanism works perfectly, and the knife snaps open so fast it’s startling. Well, for me it was. I believe it originally had a box, but it’s disappeared over the past 55 plus years. The knife was wrapped in tissue paper and I believe all marks on the Stainless Steel are from tooling, but I am not sure. Pictures are included. I have no one to pass this on to and would like to sell it. Any suggestions would be appreciated. Absolutely no alteration has been done to the photos other than cropping and size reduction for easier transmission. I have the originals in full format. You'll get your best return on Ebay...unless they remove it before the end of the auction. It seems like that happens about 50% of the time. Though, if you have never sold knives there, you might have better luck. You could sell it on our auction site but you won't get as much as you would on Ebay. You definitely want to try to get that missing guard. It wouldn't be too hard to find a new one, or have one made but getting the original would be best. Could you get a magnet behind the desk? ...in the meantime, I'm going through all of my wife's old jewelry boxes she's had before we got married! lol...Nice "re-find" Kathy! Thanks so much. Good luck with the jewelry boxes. You will probably be amazed at what you find. I have so many OLD pieces of jewelry that look like they are worth a fortune, but I'm sure aren't. My desk is a built in oak unit with four sections and high backs. I believe it actually went down one of the holes in the rear that are drilled for cords and computer cables. LOL. I spent so much time looking and even have an extension rod thing with a magnet on the end. Without disassembly, I'm out of luck. I have so many projects at the moment, that's low on my list. Maybe someone will offer to sell me one! Hi again Jules...I forgot to say that I hate selling things, especially on Ebay. Not sure what I'll do with it...K.
Kathy pm sent I’d like to buy this knife from you. Yeah Kathy, I'm still waiting to hear back from you as I pm'd you yesterday about purchasing this. I'm sorry! I didn't get a notice. I will check now. Thanks. It will be at the top of the home page. A bell and an envelope, there will be a 1 beside it, click on the envelope for your message. Thanks Sammy. I had quite a few messages and sent replies. No problems finding them. Just hope I answered everyone. The bottom line is I think I need to do some research...K.
Kathy in Oregon wrote: Thanks Sammy. I had quite a few messages and sent replies. No problems finding them. Just hope I answered everyone. The bottom line is I think I need to do some research...K.
Missed mine but thanks anyway. Check out eBay and see what they are selling for. Should give you a good idea of it's worth. If you want the eBay price you'll probably have to sell it there though.